We're at the end of October so I thought I would share my October 12 New Things results with you! My new thing for October was...jogging. I am obviously disturbed to decide to do such a thing when I am so out of shape - LOL! Not a surprise that I let more than half the month slip away before I even attempted one jog! My son decided to try jogging with me as he wants to get in better shape too. Love that kid! So - a couple weeks ago we went on our first jog. Pros...actually did some jogging, went about a mile and a half, drank some water. Cons...over 90 degrees out, did more walking than jogging, felt very out of breath. That first one was really hard and had me wondering what I had gotten myself into. I do think the hot temp had a lot to do with it though. The second one a couple days later was much better! We went about two and a half miles and I jogged more than half of the time. I felt better, but it was still hot out at that time. My son decided he was very bored too - LOL! I only got one more jog in this week and went on my own in the morning. The weather was much cooler and I did better! I walked a quarter mile to warm up, jogged about 2 miles with just a couple brief rests (walks), and walked the last quarter mile. I felt really good about how I did! Now you must know that my jog is s.l.o.w. but I hope to speed it up later. I like this better than walking because I can tell it's more cardio and burning more calories. If I keep it up, it will definitely help me drop a few pounds. I do want to keep going with the jogging, trying for three times a week. I'm glad I decided to do this as one of my 12 new things because otherwise I wouldn't have attempted it any time soon! I did finish reading my book for October - Organizing Magic. No, my house is not magically organized now, but I did get some good ideas from the book and am trying to use them and improve! My October project to finish was organizing our big file cabinet. File cabinet? What file cabinet? Oh - THAT file cabinet. Well. I did help hubs organize the garage and go through a bunch of boxes - does that count? I ended up with even more things to file away in that cabinet - sigh. I will get it done. I'm at a point where I could get it done in a day - not bad! 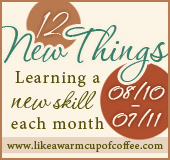 Do you have a 12 New Things list? How did you do for October? Thanks to Sarah Mae at Like a Warm Cup of Coffee for starting me on this journey! Up next - making homemade pie crust for November! You go girl! I admire you for even attempting. I do the run walk run walk method and I hear that's actually better for you than constant jogging. So if that makes you feel any better, then "run" with it. LOL! Big who wants to file things when there are books to read, goodies to make, jogging to do size hugs to you! Good for you!! As you may know, I started jogging (I like to call it running, but it really is jogging, lol) and I love it. It makes me feel great. I don't go far. 2 to 3 miles, and I walk some, but it's great to be outside and be moving. Keep up the good work!! I've always played sports, but have never been a runner. This spring I decided it was time. It was a good way for me to "escape" my daily life with a toddler. It started for fun, but then I decided to run a 5K. That was the best motivation for me. I don't think I would've kept running if it wasn't for that. Keep it up! It's so hard to get out there, but once I do, I feel great!